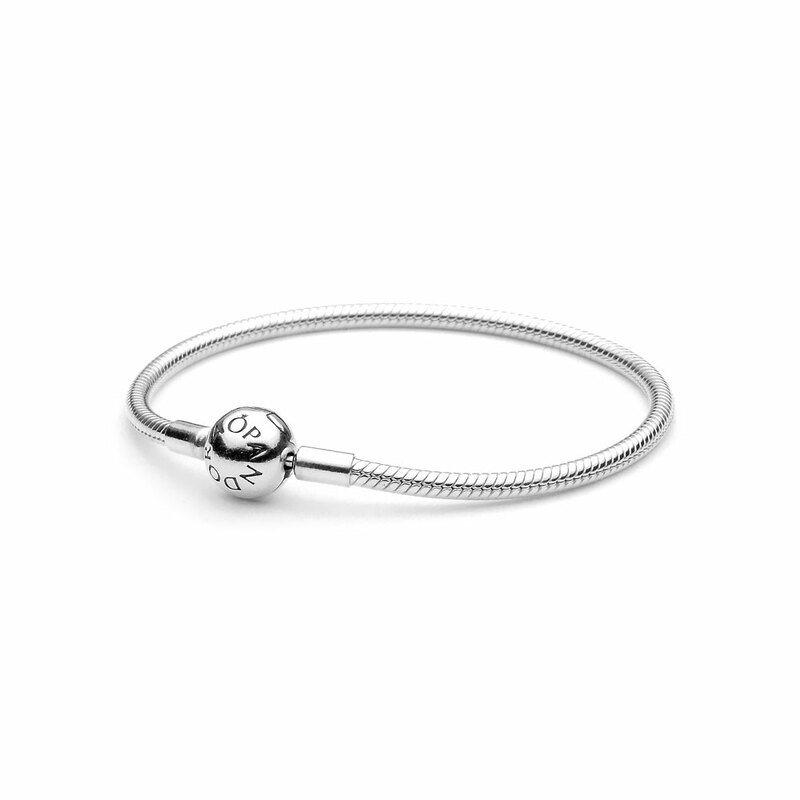 Simple and elegant, this smooth snake-chain bracelet by PANDORA can be worn on its own or with your personal selection of charms. To create a charm design that is fixed in place and will not move, style your bracelet with silicone-based clips. MOMENTS Smooth Clasp Bracelet is rated 4.9 out of 5 by 22. Rated 5 out of 5 by Vianey3 from Prefer over the classic I love how versatile this bracelet is. This look great layered with the silver bangle bracelets. I prefer this over the classic bracelet b/c you can choose to place clips or no clips, does not have the twist like bits on the ends, and i feel like this is even more comfortable wear. I do also like this a bit more than the bangle b/c this can be filled more than that one since this is stronger. Rated 5 out of 5 by Bigmommarenee from Perfect fit I have purchased several bracelets, this time I got a size smaller than I normally would. The bracelets seem to stretch out a lot over time. The more charms you add the bigger it gets. I knew they stretched but not as much s the last 2 bracelets did. I even tried the stainless steel under silver. It is stretching too. Rated 5 out of 5 by Granma from Purchased 2 elegant bracelets & 2 pretty charms. I have 2 daughter's ages 24 & 18. I thought about what I could get them for Christmas gifts for about 2 month's. I wanted something very pretty & special to where they could keep it as a token of my love for them and maybe they could pass it on to their daughter someday as a reminder of just how much their mommy's meant to their mother. Then PANDORA sent me an e-mail & I was sold! They are truly elegant, beautiful pieces that I'm sure will be surprise them & they will be so happy with what I came up with. I purchased 2 amazing bracelets & 2 charms that has a message from my heart. Since I purchased all item's on the same day & it was1order, PANDORA sent me a beautiful bracelet for me that is a limited edition piece that has the same value as the 2 bracelets that I purchased. I am honestly ecstatic over how this came togeather & can't wait til Sunday to give my girls their gifts. PANDORAS team members were so helpful to me online, talking on the phone & I even had to make a trip to there store in the mall to exchange 1 bracelet for a different size but their employees treated me with the up most respect as soon as they saw me coming. In closing I just want to say that I recommend checking out PANDORA for any jewelry needs. You cannot beat nor purchase better quality jewelry at great prices and recieve such personal service anywhere.They have something that will definitely serve any of your loves or that hard to buy for person in your life. I say you can't go wrong when you 'think' PANDORA! Rated 4 out of 5 by GuffAbbott from Beautiful bracelet/difficult clasp I purchased this bracelet for my wife for Christmas. She loves it and is very excited about acquiring new charms to add in the future. The only problem she has experienced is with the clasp design. The clasp is very difficult to close with one hand and she almost always needs assistance to close it. She is able to close the clasp with one hand but it takes a good deal of time and effort to do so. This is her only complaint. However, because if this, she said if I could purchase the bracelet again, she would choose one with a different clasp. Rated 5 out of 5 by MamaPerro from Absolutely Love It. I chose this bracelet over the usual Pandora bracelet because 1) I already have to of the standard bracelets and dont like the spots where clips need to be put. 2) if you don't use clips your charms go wherever they want. 3) I want to separate my charms in certain order of meanings and out clips where I want them. Hence why the smooth bracelet is perfect for me. Now I can't wait to get new charms for the smooth bracelet so I can separate some of my charms from my other two bracelets because they are plum full and can't move. Rated 5 out of 5 by Lady Lotus from Simple yet beautiful I purchased this bracelet in Banff Canada as a gift for myself. I also purchased the Canada Maple leaf as my first charm. I love that the stoppers are not on this bracelet. It is a very sleek and slim bracelet. My only issue is it grabs the little hairs an my wrist a lot. I have a very small wrist and this bracelet compliments me well. Rated 5 out of 5 by Georgie from charming even without charms The removal of the threads on this bracelet is delightful. Charms are free to move around creating a pretty 'tinkling' sound when worn. The bracelet never looks 'empty' as the threaded chains can. Wear it solo and over-sized as a sophisticate silver bracelet, no charms necessary. Would LOVE LOVE LOVE this in an oxidised version. Be warned however, safety chains are useless unless used with a clip, perhaps Pandora could introduce a clip version safety chain to address this. Rated 5 out of 5 by Emily Sarah from Perfect I bought this for my Granddaughter for Christmas...she cried. Success!! And now I can buy charms for future events...brilliant.